After searching for years I stumbled on a supply of original Mk VII (Mark Seven) bags just like the ones used in the Indiana Jones movies. 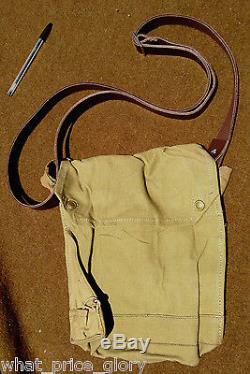 These are original bags made in 1942, not my famous reproductions. These bags appear to be in unused condition, and in very nice condition after 60 years of storage. These bags come with the original web strap. Bag Dimensions are approximately 10" x 10" x 2, with internal dividers. I do not sell by maker. This offer is for one original Mk VII bag AND my reproduction leather strap, copied from the shoulder strap used in all Indiana Jones movies. The strap is adjustable to fit anyone, and attaches easily to the bag. The original web strap has been removed. If you want a bag in original condition with the web strap instead of the IJ style leather strap, please see my other listings. The item "Original Mk VII Indiana Jones type Bag with Leather Strap" is in sale since Thursday, January 22, 2015. This item is in the category "Entertainment Memorabilia\Movie Memorabilia\Wardrobe\Reproductions". 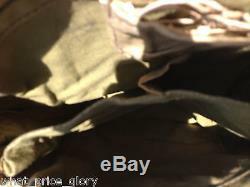 The seller is "what_price_glory" and is located in Salinas, California. This item can be shipped worldwide.